So blissed out and blessed to be working on this beautiful summer gathering! Here is the full lineup for Portal to the New Earth! I sure hope to see you May 3-6 at #garthsbouldergarden for 3 amazing days of sound journeys, workshops, music, yoga classes and camping! There are a total of only just 222 tickets available and $222 early-bird tickets are almost gone! See you at Mayan Heart Festival Dec 20-23rd for the Winter Solstice! I work collaboratively with the producer as a consultant on top admin processes including but not limited to ticketing, staffing, booking, and marketing. I design & co-manage social media content + do postings for the festival as well as assist as a consultant on the marketing design team. I created and admin the Mayan Heart Festival Community group on Facebook. I designed the website and manage updates for ALOHA Kauai Yoga & Peace Festival, a non-profit festival in its first year. I design social media content & post for the festival as well as assist as a consultant on the admin design and core production team. I work as a consultant on the core production team in charge of booking, ticketing, staffing, and marketing. I created an admin the ALOHA Festival Community group on Facebook. I design Facebook & Instagram post for the festival as well as assist on the marketing team in charge of Twitter, Soundcloud, Spotify, and Youtube. I design the Instagram story for SONIC BLOOM and integrate live event presence promotional appearances with our social media. I created an admin the Sonic Bloom Festival Community group on Facebook with over 7.8K +active members. I manage SONIC BLOOM promotional teams including a pre-festival event “tabling” promotion team in charge of collecting emails from those interested SONIC BLOOM. 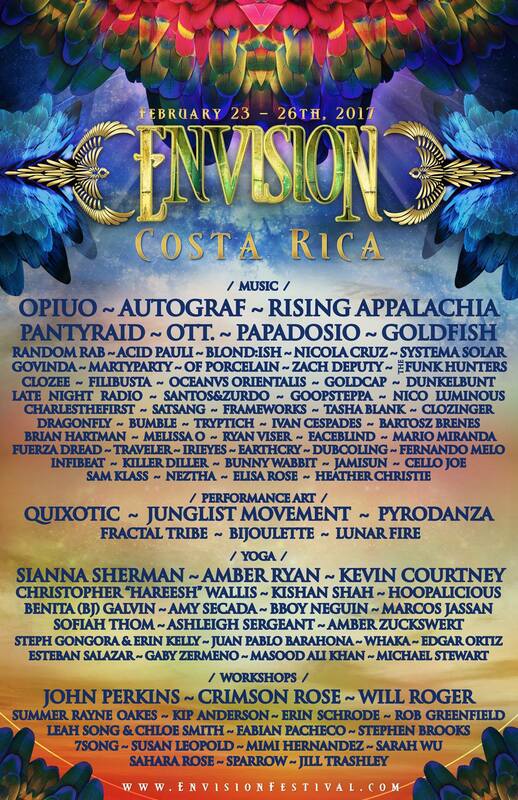 Helped contribute to the social media promotion and street promotion of the SOLD OUT 2018 Envision Festival. 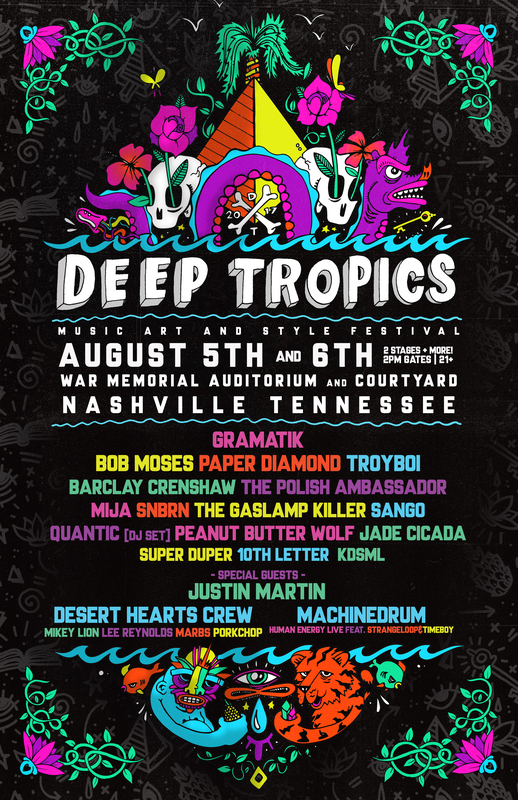 Managed and oversaw all operations of the VIP & ARTIST ONLY VIP areas at War Memorial Auditorium for the 1st ever Deep Tropics Music Art & Style Festival 2017. Managed and oversaw all operations of the VIP & ARTIST ONLY VIP areas Pre-Event poolside cocktail parties at East Ivy Mansion during hours of operation prior to the main event at War Memorial Auditorium. Assisted in the acquirement and delivery of VIP & Artist Lounge Decor / Furniture placement and ensured VIP Lounge was presentable and welcoming offering a laid-back and “tropical vibe” at all times. Served as liaison with sponsors and co-producers/partners hosting receptions/activations in the VIP Areas/Lounges. Provided VIP concierge coordination services to VIP attendees such as providing transportation coordination from pre-event VIP cocktail parties at Easy Ivy Mansion to the main event at War Memorial Auditorium. Provided high-quality pre-event promotion of the VIP “Deep Islander” & “Tropical Islander” opportunities via personal marketing channels and social media outlets. Coordinated with and assisted the PR/Event Marketing team to update Deep Tropics social media on Instagram. Created the Instagram Story for both days of the event 2017. I assisted the producer social media postings for Sonic Bloom across Twitter, Instagram, and Facebook. I also updated and maintained the Youtube and Soundcloud channels for the festival creating the custom playlist for 2017 artist. I created an admin the Sonic Bloom Festival Community group on Facebook with over 8K active members. Paid bar staff for main stage bar for Friday & Saturday night. Helped facilitate inventory product distribution and management for VIP, ARTIST, and STAFF hospitality areas including all items ordered from various local food/beverage/produce vendors. Worked directly under Envision Festival Hospitality Annex lead coordinator to assure proper support of her role. Circled back to all hospitality departments throughout the entire festival to ensure proper support of all hospitality areas. Promote new local music venue by sharing upcoming event content across all social sites, writing an engaging blog post about upcoming events, and inviting the VIP target market audience to upcoming shows via social media platforms and clients social sites. Severed as a backup Backstage/Artist Hospitality manager for Colorado Chautauqua Auditorium. Shopped for rider items and set backstage areas per agreements. Trained and worked as a security staff at Fox & Boulder Theaters in Boulder, CO.
As the ARISE Music Festival Office Manager, I promoted the organization and focus in the workplace by maintaining a professional workplace experience at all times. I served as a constant point of contact throughout the year for all communications in the off-site Boulder, CO office space. I strategically managed and implemented all social media marketing actions across all platforms and apps that the ARISE Festival is on. I served as the Internship Coordinator where I managed a group of 30+ Interns, many of who received college credit for their involvement in the ARISE Festival Internship program and/or moved on to acquire paying positions with ARISE. I managed the ARISE Festival promotional teams including a pre-festival event “tabling” promotion team in charge of getting interest in the ARISE Festival via email sign-ups at venues like Cervantes Masterpiece, The Aggie Theatre, and Boulder Creek Festival. I managed a successful Digital Street Team with an amazing app called CrewFire as well as a Core Volunteer team of VIP volunteers. I helped contribute creatively to all admin processes including talent buying by suggesting several acts that were booked by producers including SHEL and Living Light. I managed all Vendor/Sponsor book keeping for checks received and deposited. While I wore many hats as an ARISE Festival staff member my primary job was to increase interest in all the ARISE Music Festival has to offer to current/future staff and the general public. Therefore, success in this role could be seen by the sale of 40% more tickets over the course of the entire 2016 festival season. Was selected to help as a “fee waived” volunteer in the production office at Sonic Bloom in 2016. Helped maintain working order of festival production office in the early part of the festival week by sweeping and cleaning out the office of mounds of trash, recycling, and debris. Helped support decor team for VIP areas and stuffed VIP swag bags. Supported Backstage Decor Coordinator with set up of all backstage green room areas. Promotes local venue by sending Facebook invites, sharing blog post and social media content across all social sites. I managed the ARISE Festival promotional teams including a pre-festival event “tabling” promotion team in charge of getting those interested in the ARISE Festival via email sign-ups at venues like Cervantes Masterpiece, The Aggie Theatre, and Boulder Creek Festival. While I wore many hats as an ARISE Festival staff member my primary job was to increase interest in all the ARISE Music Festival has to offer to current/future staff and the general public. Helped build Android Jones Art filled gallery and manage daily schedule of art sales, live-glassblowing, and happy-hour events presented by The Colorado Project & Star Seed Studios. Helped facilitate VIP event experience for “Dancing With The Stars” LIVE tour. The second year of ARISE I helped promote the festival at The Aggie, Cervantes, and several other venues by setting up promo tables with event posters/fliers, merch, and got hundreds of email sign-ups to help sell tickets to the festival. I served as digital marketing coordinator for the retail location, online store, and special events. Worked with management to plan, promote, and solicit sponsorship for community events such as Hill Block Party 2014 (500+ attendees). Field Promo Work. Hung posters all around Denver/Boulder to promote shows at Red Rocks, Cervantes, and much more. Helped build and manage geo-dome art galleries for ARISE Festival 2013, Sonic Bloom 2014 and Sonic Bloom 2015. Helped work door at special events such as the Boulder Flood Relief Party at Boulder Vapor House. Field Promo Work. Hung posters all around Denver/Boulder to promote shows at Red Rocks, The Ogden, The Bluebird, The First Bank Center, Dicks Sporting Goods Park, and many more.